You can participate in our "Shipping for Giving" philanthropy program by signing up for any of our auditing solutions. Ship Watchers provides Small Parcel, LTL, TL, Ocean, Air, and Rail auditing solutions including Contract Negotiations and Customized Reporting. As a client of Ship Watchers you can opt into our philanthropy program within your Web Portal by agreeing to the basic terms and conditions. Clients have the option of utilizing the savings recovered through our auditing efforts for donating or providing a direct contribution by check or credit card. Select the philanthropy or charity of your choice through our "Shipping for Giving" dashboard and enter a percentage or dollar amount you would like to send. Monitor payments to your organization and download written acknowledgements. As an extra incentive to participate in our "Shipping for Giving" philanthropy program, Ship Watchers will match up to 10% of all client donations from the recovery of incorrect charges and errors found through our auditing solution to the organization of your choice from our list of approved foundations. If we don't have your organization listed, we can work with you to get them added. Engauge People. Be Active. Give Back. 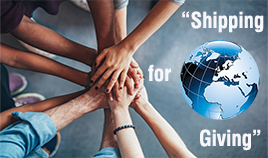 Ship Watchers has adopted a philanthropy program that will engauge our employees and clients to give back to communities across the globe in an effort to minimize or resolve global issues such as hunger, disease, water shortages, education, public health, governance, and human rights. The concept came about when discussing how Ship Watchers could make a difference in communities across the globe. We began to work with current clients that had a strong philanthropic approach within their own business culture to come up with ideas. Since the money recovered from incorrect charges and errors through our auditing solution is generally not otherwise known, together we came up with a program that would enable a client to donate a percentage of these savings back to the philanthropy of their choice while offering a "match" from Ship Watchers. Together, we all can make a difference whether at a local level within your own communities or at a global level through amazing organizations. In addition, our employees are encouraged to donate time to local charity events and charitable organizations. As an incentive for their services, Ship Watchers will cover up to 10 hours per quarter of their time out of the office. See how you can be a part of our "Shipping for Giving" and make a difference today! Are you a philanthropic foundation or charitable organization? Send us a request to be added to our approved list of qualified non-profit organizations so we can donate to your cause. A representative will reach out to you and discuss how you can be added to our "Shipping for Giving" philanthropy.